The Black Widow pulsar is a rapidly rotating neutron star that launches powerful radio jets from its poles. The jets sweep across the sky almost 625 times every second, creating a radio signal that can be heard as an E-flat note when converted to sound. The Black Widow gets its name from the fact that it strips material off the surface of the brown dwarf that orbits the pulsar once every 9 hours. In a billion years there won’t be much left of the Black Widow’s mate. In the meantime, the destruction creates a comet-like tail of gas that passes between the pulsar and Earth once every orbit. The clumpy tail acts like a magnifying lens that amplifies the pulsar’s light by up to 40 times, similar to the way that starlight twinkles after passing through the Earth’s turbulent atmosphere. This produces a series of irregular flickers that can be heard in the pulsar’s signal. In May 2018, astronomers used this enormous magnifying lens to see two regions that are 20 km apart from 6500 light years away, one of the highest resolution observations in the history of astronomy. All of the sounds in the video above are created using actual data of the pulsar’s signal which was collected by the 305 m Arecibo radio telescope in Puerto Rico. 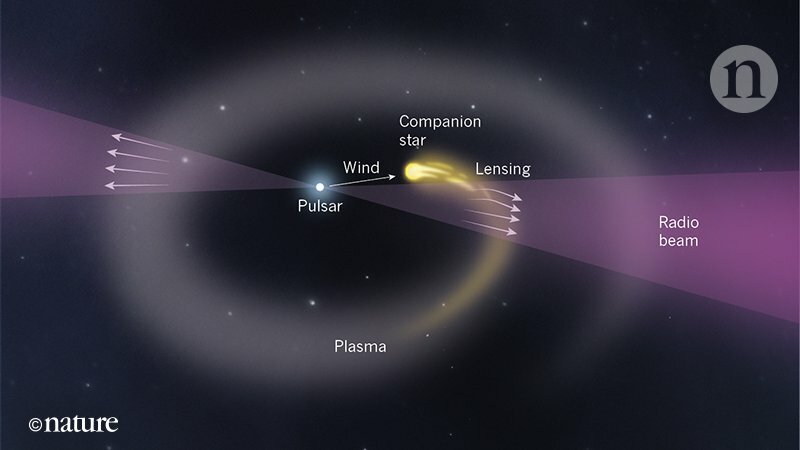 The flickering sound is the pulsar’s radio beam being magnified while passing through the brown dwarf’s tail. The percussive instruments are triggered by these magnification events and the pitched sounds are created by shifting the pulsar’s typical (unmagnified) signal to different notes. You can also listen to the instrumental version or watch the video below to hear the isolated sound of the pulsar’s flickering signal.